SAN ANTONIO (AP) — The San Antonio Spurs needed someone to help veterans DeMar DeRozan and LaMarcus Aldridge carry the load as the long season draws to a close. Derrick White provided the needed lift. DeRozan scored 29 points and the Spurs defeated Atlanta 117-111 Tuesday night for their 21st straight win at home over the depleted Hawks. “The last couple of games, I felt like I kind of let them down, so I wanted to step up and help them out,” White said. White, in his second year, scored 23 points after scoring 20 total points in his previous four games. The win kept San Antonio seventh in the Western Conference after Oklahoma City defeated the Los Angeles Lakers 119-103 on Tuesday behind Russell Westbrook’s historic game. Westbrook joined Wilt Chamberlain as the only players in league history with at least 20 points, rebounds and assists in a game. The Hawks, who were eliminated from the playoffs last month, entered Tuesday’s game having won six of 10. 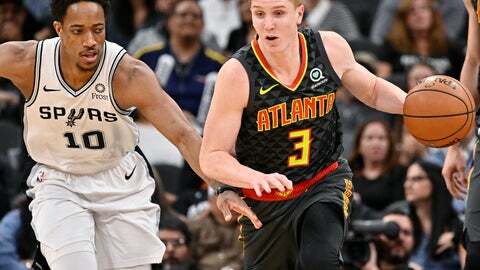 Atlanta led by as many as nine points in the second half despite missing six players due to injury, before San Antonio rallied in the fourth to avoid its second straight loss at home. Kent Bazemore had 26 points to lead the Hawks, and Alex Len added 21. Atlanta has not won in San Antonio since 1997. White had scored six points in each of his previous two games and shot a combined 7 for 30 from the field in his past four. “He had a couple of games where he struggled, but sometimes you’ve got to embrace the struggle to understand how to get out of it and what you need to do to get back to yourself,” DeRozan said. White did so, going 10 for 12 from the field for his highest output since March 12. The 24-yeard old returned to the form that made him a pleasant surprise after the Spurs were forced to move him into the starting lineup when starting point guard Dejounte Murray suffered a season-ending knee injury in the preseason. Hawks: Atlanta’s previous win in San Antonio was on Feb. 15, 1997. Steve Smith and Mookie Blaylock combined for 46 points in a 109-89 victory. . Atlanta had six players sit out with injuries. Dewayne Dedmon (left), Alex Poythress (right) and Omari Spellman each were suffering an ankle injury. … Forward Taurean Prince missed his third straight game with a sore foot. . The Hawks are 12-27 on the road this season. San Antonio has 20 straight seasons with 45-plus wins, the longest streak in league history. The Los Angeles Lakers held the record previously, winning at least 45 games in 15 straight seasons beginning in 1976. Bazemore’s 26-point game marked the first time he eclipsed 20 since scoring 23 against Minnesota on Feb .23. The 6-foot-5 guard averaged 7.2 points in March, reaching double figures in only six of 15 games.